Find ways to gain experience and learn about the power of networking. Together we will focus on professional presentation and the materials you should bring to the Career Fair and discuss the most important document that you should bring to the fair – your resume. Honors Ambassadors represent the very best that the Honors College has to offer. Up to 14 Honors students are chosen each year to represent the Honors College and recruit potential students at various events through the year. Applications to become an Honors Ambassador are now open. Please download the application form. Deadline is March 3, 2017. Help the Honors College and the National Prestigious Scholarship program by volunteering this Tiger Giving Day – February 21, 2017. Volunteers will be entered to win an Auburn prize pack. Food will be provided for breakfast and lunch shifts. 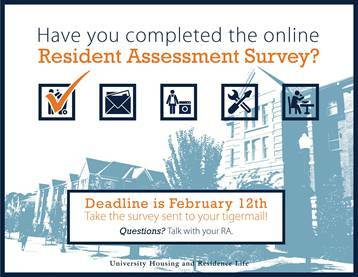 University Housing and Residence Life (UHRL) is soliciting student feedback on their on-campus living experience through their annual Resident Assessment survey. The comprehensive survey is sent to every student living on campus. Each student is sent a unique link to the online survey via their tigermail account. This survey includes questions about satisfaction with hall staff, facilities, safety and security, dining services, the community environment and resident interactions. This information is essential in helping the UHRL team make decisions to create an exceptional campus experience for all students. 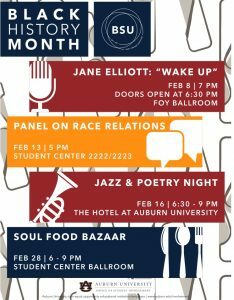 Enjoy a variety of events celebrating Black History Month, with the Auburn Black Student Union (BSU). 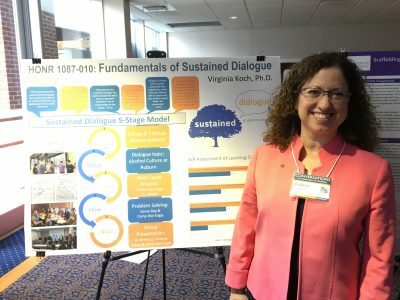 Dr. Virginia Koch shared insigts into the course HONR1087-010: Fundamentals of Sustained Dialogue, during the Conversations in Celebration of Teaching event held at Auburn University this January. We will be making Valentine’s Day cards this Thursday, February 9th for the residents at Monarch Estates, a senior living community here in Auburn. There are about 110 residents, so we will definitely need your help! There will be Valentine’s cookies to enjoy as we make cards, and we will meet in the Village Community Center from 5-7 pm. All of the materials will be supplied. This is such a great opportunity for fun, easy volunteer hours! Honors Serves VP Kaylee McCormack will sign off on them before you leave. Please invite your roommates and friends to join us! Sign up here to report your attendance. Any previous volunteers are encouraged to join the Oak Park (an Auburn nursing home and independent living facility) patient care effort. New volunteers will need to contact Katherine Gamble about training. You will be volunteering at the Hospice Office this semester so that you can get trained and oriented, then you will be allowed to start volunteer patient care at Oak Park next semester. 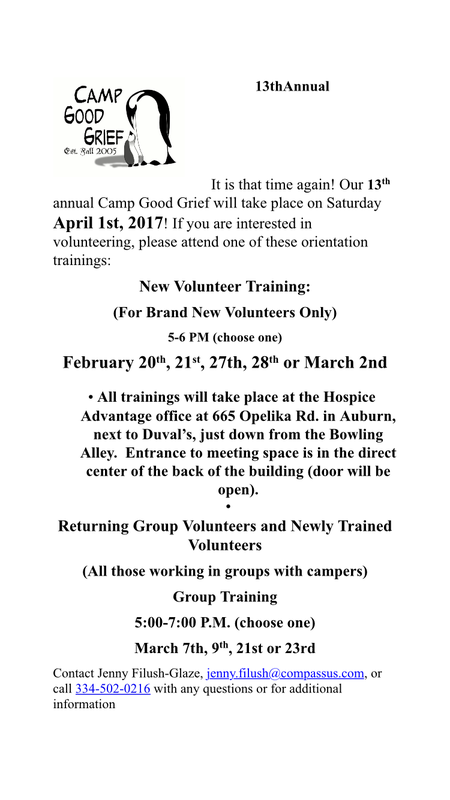 Also, this semester Hospice will be holding its annual Camp Good Grief and all Hospice volunteers are welcome to volunteer. Please see the attached flyer. Please contact Kylie Mimnaugh if you are interested in helping with this effort. Join us in tutoring sophomores, juniors, and seniors for the ACT. Contact Sam Lubor via email with any questions and sign up here. Contact Claire Zhang with any questions and sign up here. Auburn Day Care Centers is a program that cares for children during after school hours as an extended day program. They have around 37-38 kids ranging from kindergarten to fourth grade. They are looking for volunteers to help kids that need more one-on-one assistance with homework. First time volunteers will need to fill out the attached paperwork and take it to the office at 400 Boykin Street, Auburn, AL 36832 in Room 215. Be sure to bring a valid ID with you. You will then be able to help at the day care center at 720 Slaughter Avenue, Auburn, AL 36832. They are well within walking distance of one another (1-2 minutes). Please contact Rachel Breece for more information and sign up here. The application deadline for the 2017-2018 Project Horseshoe Farm Fellowship is this Sunday February 12th at 11:59pm CST. For more information please review the attached flyer and application. Project Horseshoe Farm is happy to arrange phone or Skype conversations with potential applicants if they would like more information about the fellowship opportunity. Are you looking for an opportunity to get your academic or creative work published? As an honors student, you most likely have produced written scholarship that merits submission and recognition. Aisthesis, an online journal from the University of Minnesota Duluth, invites academic submissions in all disciplines of research as well as creative works of nonfiction, fiction, poetry, visual art, and photography. The submission deadline is March 15, 2017. Your scholarly engagement in Aisthesis is a select opportunity to be published in an undergraduate academic journal as a researcher and writer. Please view the attachment for more information and submission instructions. Honors College students are invited to participate or attend this symposium relating to food policies, food movements, food and culture, food and arts, food and social media, food and environment, food and health, food and identity, and other food related topics such as community gardening, water, transportation, or recycling. For more information view the flyer or visit the website.